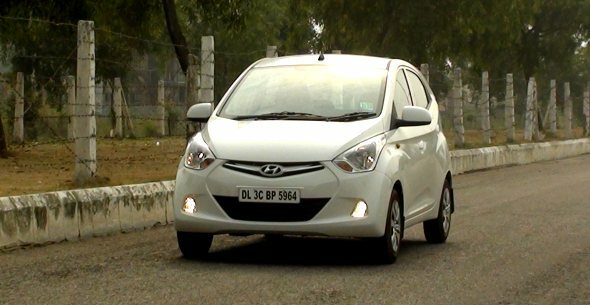 Hyundai Eon: Understanding its variants, and prices in 5 cities! Hyundai launched the Eon last month, to take on the entry level small car segment leader Maruti Suzuki’s Alto. The company had sold 6315 units of Eon within 20 days of the launch which is a promising start for an entry level small car. The Eon targets buyers who look for cars such as the Maruti Suzuki Alto, Maruti Suzuki Alto K10, Hyundai Santro, Chevrolet Spark, Maruti Suzuki Wagon R, Maruti Suzuki A-Star and Maruti Suzuki Estilo in the price range of Rs. 2.5 – 4 lakh. Let’s check out what Eon has to offer to entry small car buyers, what are the features available in each variant and how the Eon is priced in 5 different cities across India. The Eon is offered in six variants that are priced between Rs. 2.69 lakh – 3.71 lakh (ex-showroom, Delhi). The D-Lite Opt gets all the features of the D-Lite and in addition gets manual AC. The table below shows the features offered in the D-Lite with AC variant. The Eon Era variant gets all the features of D-Lite Opt, and in addition gets electric power steering, tinted glass and body colored bumpers. The Eon Magna gets all the features of the Eon Era and in addition, comes with features such as central locking, tilt steering, front power windows and internally adjustable outside mirrors. The Eon Magna Opt has all the features in Magna variant and additional features including music system with front door speakers and USB, Aux-in ports, rear parcel tray, digital clock and front & rear speaker grille. The Eon top-end variant, Sportz, gets keyless entry, front fog lamps, driver airbag and body colored mirrors and door handles in addition to all the features available in the Magna (O) variant. « Question of the day: Wagon R Duo LPG or Beat Diesel?